Coventry, home of the great Coventry City F.C, is one of the many areas within the West Midlands, where we offer our loft conversion services to. 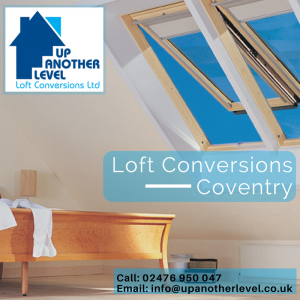 We offer a range of loft conversions in Coventry as well as a range of other cities and towns in the West Midlands. Our goal is to offer a friendly reliable service, that you know you can trust. All of our employees are highly trained individuals and their previous work speaks for itself. The cost of a loft conversion is dependent on a few key factors: the size of the area you would like to convert and the level of specification you decide to go for. You can find our portfolio of recent work and the different styles and finishes we have to offer. Having an idea of what style and finish you would like your loft makes the whole process that little bit easier but should you have no idea we can help you every step of the way to making your dream loft a reality. One of the things we like to pride ourselves in is the lengths that we go through to keep the noise and disruption down to a minimal where possible, as we all know any kind of construction work is going to produce both of these. However, here at Up Another Level Loft Conversions, we like to carry out work in a stress-free manner allowing you to continue to use your house as you would normally. With over fifteen years’ experience within the industry, we have built up a reputation for being expert craftsmen with a friendly service and minimum disruption during the conversion process. You can find examples of our previous loft conversions featured on the site and learn more about the conversion process as well as the many benefits for getting your loft converted. Not looking for loft conversions in Coventry? As well as covering Coventry, we also operate throughout the West Midlands. You can also call our Coventry team with any queries on 02476 950 047 or get in touch via email at info@upanotherlevel.co.uk.